is the thermogenic layer where rapid release of fat burning occurs. When you take Beelean Xtreme weight loss supplements, you’ll get a big boost in your metabolism that kicks off the process of your desire to have a slim figure. Whatever fatty deposits there are in your body, you can put your trust in this product because it’s going to melt them away like butter on toast. Aside from that, you’ll get a great boost of energy. In the end, the result is fast metabolism and lots of energy to spare. releases thyroid excretes and enhances your energy. With your thyroid properly stimulated, you’ll keep burning fat. Your metabolism goes on overdrive and brings you close to your dream figure with each moment that passes. The best thing about it is that you maintain your energy. This beats having to starve yourself where you feel miserable all day because you’re lacking energy. is the sustained release of fat binding and appetite suppression. When all your previous slimming plans come with the jitters or crash, you won’t feel any of these with Beelean Xtreme. Sure, you’re not eating as much as you used to and yes, you’re burning fat like a furnace put on full blast. You’ll have all the energy you need all day while keeping the extra pounds off. Take 1 to 2 tablets in the morning and one tablet after lunch. Not to exceed more than Four tablets per day. Proprietary nutriceutical designed to enhance weight loss and energy. This patent pending, all- natural nutritional supplement contains a synergistic blend of nutrients from all across the globe. “This unique supplement targets and attacks excess pounds in the most common hard to reach areas by utilizing a multi-level approach that allows for a faster, healthier and more efficient means of weight management. Everyone is different, and everyone will lose weight at a different rate. There are many factors that will determine how fast one loses weight. Weight loss needs, age, diet, exercise, medical conditions, family history and water intake can all have a direct effect on weight loss success. For instance, one who has more weight to lose will usually drop weight quicker than someone who has just a few pounds to lose (assuming they do everything else the same). Our guarantee does not state specific weight loss amounts; it simply guarantees that you’ll be satisfied with our product. How soon can I start losing weight? Weight loss varies from individual to individual. The amount of weight loss will depend on your daily diet, the amount of exercise you get and how over weight you are. Individual weight loss may be anywhere from two to ten pounds per week. However, some people lose inches before they start to lose weight, because they might be gaining muscle due to vigorous exercise while they are sculpting and losing fat. Is this weight loss supplement going to give me too much energy? BeeLean Xtreme should give you harmonically balanced energy. Scientifically engineered to work with the body’s metabolism to provide the optimum energy response level. It is simple; take one to two capsules of BeeLean Xtreme in the morning and one to two capsules in the early afternoon. Please remember to eat 45 minutes to one hour after each dose and drink ample amounts of water. Rarely, but occasionally we have people tell us that these products are too powerful for them and they feel a bit jittery (as if they drank too much coffee). Remember, sometimes it could take days or a couple of weeks for your body to get adjusted to the herbs. This is perfectly normal. This jitteriness usually passes after a little time. necessary time to acclimate to this powerful new formula. Can I continue to take other herbs/vitamins? You may continue to take your vitamins and supplements while taking BeeLean Xtreme. Will these weight loss supplements affect my current medication? This product will not affect most medication. However, if you are on any medication, we always recommend you check with your physician before starting any weight loss or nutritional regimen. Your physician will know the specifics and severity of your condition and will be better able to judge if you should be taking any nutritional supplements. Who should not take a stimulant based formula? Individuals with high/low blood pressure, Heart conditions, thyroid disease, diabetes, epilepsy, depression, glaucoma, prostrate ailments, seizure disorder or if using an MAOI (monoamine oxidase inhibitor) should consult a physician before taking. Individuals with heart ailments or if pregnant or nursing, should not take this product. Results will vary for everyone. Some see results in the very first week. Others may take up to 2 months before seeing results. To increase amount of weight loss and the speed at which weight loss occurs, try to include these things into your program: exercise 3-4 days per week, consume a low-fat, low sugar, well-balanced diet, try to eat 3-5 small meals a day instead of 1 or 2 large meals, cut back on diet sodas, sodas and alcohol, drink plenty of water and refrain from eating 4 to 5 hours prior to bedtime. Do I have to exercise while taking these Weight Loss Supplements? You do not have to exercise when taking this thermogenic product. Keep in mind that exercise is an important way to stimulate weight loss and accelerate results. We burn calories while exercising, and exercise increases metabolism. Cardiovascular exercising should be combined with some weight training. Many people are afraid to do weight training for the fear of “getting big”. But weight training is one of the best ways to burn calories. Plus, by adding muscle to your body your resting metabolic rate will be drastically increased. This is because muscle needs more calories to sustain itself than fat does. By increasing the muscle on our bodies, we burn more calories every day, even if we are just sitting still! One pound of muscle actually burns 50 calories a day. If you replace 10 pounds of fat with muscle, your body will burn 500 more calories a day! (Burning an additional 500 calories a day sure would make it harder to ever gain weight again. Do I have to take BeeLean Xtreme with food? Recommended not take any supplement on an empty stomach. If you have a sensitive stomach, or if after taking this product you get an upset stomach or feel disoriented, you should eat something (low in calories) 45 minutes to 1 hour after taking each dose. How do the weight loss supplements BeeLean Xtreme work? BeeLean Xtreme works by increasing the metabolic rate. BeeLean Xtreme does this by increasing the rate at which the BAT (brown adipose tissue) utilizes fat. Many people have a weight problem because their BAT is not functioning properly, or at all. Our thermogenic formula increased the effectiveness of the BAT thereby increasing the overall effectiveness of the metabolism’s ability to burn fat. 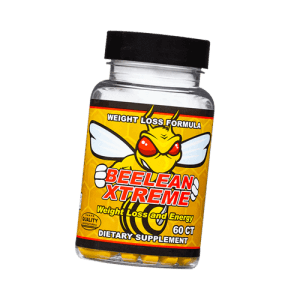 What are the side effects of BeeLean Xtreme? There really are no major side effects from BeeLean Xtreme. We rarely get any complaints. But of course, like any other nutritional product, BeeLean Xtreme may not agree with everyone. We occasionally receive comments from consumers stating this product makes them feel jittery, disoriented or this product gives them heartburn. The jitteriness usually occurs because one’s body is adjusting to the herbs. This usually goes away after a week or two. We usually find that those who get heartburn are individuals who have a history of heartburn. If you drink caffeine when taking BeeLean Xtreme weight loss supplements, you may experience a small amount of nausea. If this happens to you, try not to drink any caffeine within a couple of hours of taking the product. Eating yogurt usually alleviates these symptoms. Are these Weight Loss Supplements FDA approved? BeeLean Xtreme is a nutritional dietary supplement. In most cases the FDA does not approve dietary supplements. However, our manufacturing facility meets the highest standards and requirements for manufacturing nutritional supplements and is an FDA inspected facility. YES! BeeLean Xtreme is an all-natural dietary supplement consisting of herbs, vitamins and minerals. Do I have to follow a diet with these weight loss supplements? We do not have a specific diet that you must follow when taking our thermogenic product. In other words, you do not have to eat 6 grapefruits, 10 egg whites or 5 bananas every day! This is one of the nice aspects about thermogenics, because they actually increase the metabolism all by themselves. We do however recommend a well-balanced diet consisting of 3-5 small meals a day. Yes that’s right, we recommend eating often! We do not want you to starve. It is actually better to eat smaller more frequent meals than to eat 1 or 2 meals a day. Keep this in mind when planning. How do I know if these weight loss supplements are working? There are several feelings that tell you that BeeLean Xtreme is working. First, you will definitely notice that you have more energy. This is one of the bonuses of our thermogenic product. Next you will notice that you have a suppressed appetite. You will not feel as if you need to eat as much in between meals or during the meal. Some people even feel as if this product gives them a heating effect. They feel slightly warmer than usual. This occurs because some of the herbs naturally heat the body (which is where some of the increased fat burning effect comes from). Why do I need to drink so much water when taking weight loss supplements? Water suppresses the appetite and aids the body in getting rid of fat. The liver is the place where fat is metabolized. The kidneys need water to function properly and if they do not have enough water will pass work onto the liver (where fat is being metabolized). If the liver is getting work from the kidney, then it cannot metabolize fat, as it should do naturally, therefore fat gets stored in the body. Many people feel that they ‘retain’ water. The easiest way to avoid this is to drink more water! The body retains water when it has less than the amount it needs for daily functions. It views this lack of water as a threat and holds on to as much as it can. If we increase our water intake, then all the stored water will be released by the body…no more water retention. Water retention may be brought on by excess salt intake. Our body only needs so much salt. Taking in to much salt, the body will need to hold on to water to dilute it. Also keep in mind that an over weight person has greater metabolic needs. Therefore, they will need more water to efficiently run the metabolic process. Gender: In general, doctors are now recommending that a healthy adult man should drink approximately 13 cups of water per day and a healthy adult woman should drink approximately nine cups per day. Numbers are determined by the average amount of water a person will lose throughout the day through excretions, as well as the amount of water required to facilitate bodily functions. What do I do after I reach my weight loss goal? While reaching your weight loss goal, you may decided to stop taking the product, healthy lifestyle changes that promote weight stability must be incorporated. These changes include continued water intake, balanced low fat, lower calorie diet and regular, moderate exercise. It is best to approach these changes while one progresses with their weight loss program. One can start by gradually reducing their intake of fats and sugars. Don’t eliminate the foods you like altogether, but an adjustment towards moderation will help make the transition easier after your goal is reached. The Key to Keeping Weight off. Keeping the weight off is to burn the same or more calories than what are consumed. Regular, moderate exercise will help your body burn calories as will sticking to a lower calorie diet. Some individuals continue to do well for some time after stopping the product. When there is a little slip in weight, you may need to pay more attention to your diet and exercise and keep taking our weight loss supplements. Wonderful weight loss product. Helped me lose 28 pounds before my wedding. Had to have my dress altered twice. I would recommend this product to anyone wanting to lose weight. Slows my desires to eat as much. Wow! with the energy boost within a half hour of taking it, has me moving much faster for most of the day. If you want to stop cravings for food, this is the product to use. I take two a day and find myself eating so much less. I do feel i need to drink a lot more water or fluids, but I’ll take that over weight gains any day. Lost 14 pounds after six months but believe could have done better if i would have taken the product daily as recommended. I now have my mom using it just for energy. She only takes one a day and says it works for her all day. A good friend on mine told me about this product years ago so I decided to give it a try. Sure glade I did. Has help me with weight loss for many years now. At first I was getting the jitters but after a couple of days that went away. Give this product a try. I don’t think you’ll be disappointed. Love this product. 68 years old and work nights. For so many years having trouble staying awake while working. A friend of mine turned be on to the Beelean a few years ago and awake I stay. Great daily energy supplement. Great product, would have given a 5 star but the price is two high. Well, I guess if you buy more then one bottle it’s not to bad. Just can’t afford that much at one time. Really works good for weight loss.